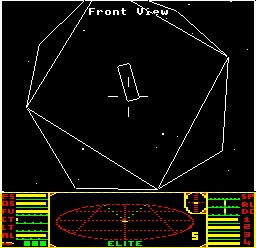 I remember gazing at the screen of Acornsoft’s Elite in my childhood wondering what the code behind those 3D images looked like. How did they rotate like that? How did it know which lines to hide? And more importantly where I can get a good price for this cargo hold of radio-actives and platinum? Scouring through magazines, books and the library revealed nothing. Where on Lave was this elusive magic formula? My attempts at reverse engineering Vu-3D shed no light and the web was still being conceived in Mr Berners-Lee’s brain so Google wouldn’t be able to exist for some time yet. My programming continued on a more serious tract writing first silly hacks and demo’s, then utilities and into business software as an actual paid job. In my spare time I knocked out some other developer tools, utilities, drivers and even a Flash game of pool for a National Lottery. 3D remained the elusive beast long after the information became available to me. Matrices were not something my mind wanted to grasp a second time. Then along came OGRE, written by a long-time friend of mine – Steve Streeting. We’d actually hoped to write a game a long time ago when we were younger and less informed about how much work that would involve. The only thing that survived was the company name I still use for my consulting work – Envy Technologies. Ogre looked promising. Object-oriented design meant it could hide most of the complexity and let me get on with high-level concepts and setting properties. If only my degree wasn’t in the way! Still I had a play and then the lure of Microsoft’s XNA came along. XNA has been interesting to mess with at least on the 3D front. I’ve managed with not too much effort to plot a pyramid on the screen using co-ordinates I figured out, get it bobbing about a bit and changing the color via vertex and pixel shaders respectively and even get it and the viewpoint spinning round from the 360 controller. From there on you find yourself soon needing features that aren’t there and you have to build yourself or acquire an engine to do it. The managed nature of XNA means that any engine you want to use will have to be specifically written for XNA itself – I guess Garage Games is hoping to cash in once XNA 1.0 gets out with their XNA engine Torque X.
Steve popped round this weekend for a chat about the usual geek topics we discuss I was very grateful that he lent me one of his complementary copies of Pro Ogre 3D Programming (he was technical reviewer and wrote the foreword). I’m only at the end of Chapter 3 so far and with the exception of wondering what Scene Graphs were I’m still following everything. Maybe I’ll be able to escape my 2D prison soon.